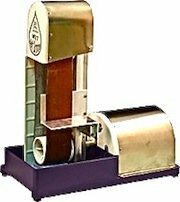 A wet belt sander will carry out many fused glass and stained glass grinding operations. Sanders range in size from floor standing models to bench top designs. Because of its versatility the wet belt sander is considered by many glass artists to be the most valuable of cold working tools. Covington Engineering produce a range of wet belt sanders that can be used in the home studio. These sanders are quite versatile and are capable of handling a wide range of grinding operations. This company has been involved in glass and lapidary equipment for many years and offers machines at varying price ranges. A less powerful unit is available from Gryphon and is more suited for home glass jewelry makers and others doing light glass fusing work. Like other belt sanders it relies on an endless belt to provide a grinding surface for the glass. Belts are easily changed and come in coarse, fine, ultra fine and cork for final polishing. Thses sanders are ideal for cold working processes before or after fusing. Glass grinding generates a lot of heat so the belt runs against a wet sponge in the bottom water reservoir. As well as keeping the belt cool the water will capture some of the glass dust. The sponge is easily replaced, replacement sponges can usually be found in your supermarket. 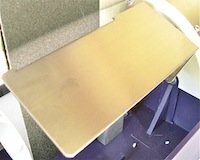 The grinder has an adjustable work table that can be adjusted to allow a bevel angle to be ground on the glass. This type of grinder is suitable for light fused glass or stained glass work. The range of belts allows for large amounts of glass to be removed up to just fine polishing. The belts are about 3" wide. Grinding straight edges , curved surfaces, flat surfaces, spike removal, and bulging surfases are some of the processes available; unlike the small grinders, which use a round grinding head, these grinders handle larger glass items. Like all grinding equipment protective eye wear and other protective clothing should be worn. If you are carrying out light glass fusing as well as jewelry making the Gryphon wet belt sander may be worth considering. This equipment can be supplied to suit international voltages. For more heavy-duty work other styles of belt grinders are available at a higher cost. Delphi Glass have Wet Belt Sanders available for home glass fusing.